Facebook is the most popular Social Networking website on the Internet, and it offers unique opportunities for business. But before you jump in, remember that Facebook is first and foremost a Social network. Most users are on Facebook to catch up with old friends, keep in touch, and just have a little fun. As a business person seeking to promote your business, you’re going to have to “blend in” in order to be successful, Here’s some tips to help you successfully promote your business on Facebook. Take it slow. Facebook is a more personal venue than a professional one. “Selling” on Facebook is subtle, and should not be done aggressively. It’s about building relationships. Start with a personal presence – build your professional presence slowly. Your Online Biography. Complete the Information section of your Profile, and be sure to include your website address and other business information. Casual friends may never dig into this information, but a potential business associate may look here for more information before considering working with you. And while it’s OK (encouraged) to share personal information like hobbies and interests, do keep in mind the privacy of your family, friends and associates. While it may be fine to list yourself as married, you may not want to tell everyone the names of your young children or relatives. Privacy. Facebook gives you a lot of controls to decide who sees what information. For instance, you can set your profile so that everyone can see you enjoy skiing and swimming, but that only Friends can see your religious preferences. Be mindful of posting information of friends and relatives, especially small children. You can and should set different Privacy settings for your Business Page, because you’ll probably want this to be more accessible to the general public than your Profile page. Use an appropriate Profile Picture. Some Facebook users choose amusing Profile Photos, like cartoon characters, animals, places or other things that suit their mood or personality at the time. As a Business person, you need to be more professional. You don’t need a suit and tie or a professional headshot, but you do want to be recognized and present yourself well. Remember, the people you want to reach are people you want to do business with. Get a Business/Fan Page. These pages will help separate business and pleasure. They will also help keep your posts more balanced. Friends (personal) and Fans (of your Business Page) can be two different groups. On the one hand, don’t be offended if only a handful of your friends sign up as fans. On the other, keep in mind that you can have Fans that are not your Friends, and open up your business to all Facebook users, where you may not want your Personal Profile to be that visible. On the Business/Fan Page, people expect to see you go on and on about your business, and this is your place to get business-centric. Post Content. Post content that highlights your personal interests and areas of expertise. Facebook is all about sharing that which makes us our own, and your business does factor in. Just keep it balanced. Take advantage of your Business page when posting business news and your Profile page for personal things. An occasional business post to your Profile is OK, but spamming your profile or other users with business news is not. Being passionate is OK, but no one wants to hear every little detail of someone else’s life – business or personal. Join Groups. Join and participate in groups that attract the demographic you are interested in. In these groups, people are all interested in the same thing. 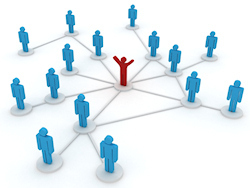 If you participate in the group you may find people coming to you for help. Posted content is Public. Once you post something, consider it public. Though you may hold the rights to a news-bit, article, photo, or video, the Internet won’t help you retain control of your work. Anyone can take an article or photo and repost it anywhere (even if it is not legal to do so). If you don’t want it to be in the public domain, don’t post it. Advertise wisely. Facebook tracks some key information about it’s users, and allows advertisers to target specific demographic groups. As a businessperson, you can use these demographics to reach specific groups of users and drive them to specific goals (your Fan Page or Website). And just as in Search Engine Marketing, you need to have systems in place that will allow you to quantify your results, so you know where best to spend your money and your time. There’s no sense advertising if you are not tracking and seeing the results. Beware of Scams. Facebook is not beyond scams. People re-post things all the time, and they are not necessarily all good. Some viruses have learned how to infiltrate user profiles and send out links all by themselves. Some users have had their profiles compromised by others seeking to impersonate them. Just like email, you should question every posted link and click cautiously. There are some really nasty people out there. Have some fun … but keep it focused. By all means participate in the more personal venues Facebook has to offer; it helps keep your name out there and brings you closer to people. But it’s easy to become immersed in Facebook’s social aspects and some find it consumes more time than they would like. Facebook should be just a part of your other many marketing efforts. Set a schedule and a routine to keep yourself focused on everything that needs to get done in your busy day. Wherever you are, be there. This is my favorite Internet Marketing mantra and can be applied to most of your marketing efforts: If you advertise a phone number, you better answer your phone. If you have a website, it needs to be fresh and up-to-date. If you post an email address on your website, you need to respond to inquiries promptly. If you want Facebook to help you grow, you need to participate. You can’t just put up a Profile or Business Page and expect business to roll in. It’s an ongoing process. You need to give in order to receive. Make sure your web host is doing their job. Your site needs to be responsive and available at all times to maximize your visibility. Make sure your site is being backed up regularly, so that if something does go wrong you’ll minimize downtime.